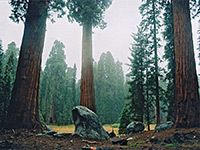 Sequoia and Kings Canyon National Parks have over 800 miles of trails, including plenty within easy reach of a paved road and suitable for a variety of dayhikes, though much of the Sierra Nevada backcountry is only accessible via longer trails on overnight backpacking trips. For Sequoia National Park, most paths are in the Giant Forest area - a complex network of intersecting trails cross the hillsides east of the Generals Highway so many different loop hikes are possible; fortunately each junction is well signposted. The two other main trailheads are at the Wolverton ski area and the Lodgepole campground. Below is a listing of the major day hike trails. The Giant Forest Map shows the location of all the central trails. 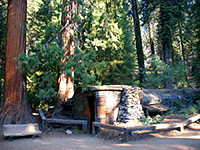 Alta Trail The long distance Alta Trail passes through several different environments; starting at Giant Forest Village the first few miles pass right across the heart of the sequoia groves, intersecting with many other paths in the area. Next the trail moves through more conventional pine and fir forest, all the time gaining height steadily, and eventually emerging above the treeline around 9,500 feet. The final section climbs the south face of Alta Peak to the 11,204 foot summit, for magnificent views of the Sierras. If this is the final destination, most people begin the hike at Wolverton, joining the Alta Trail at Panther Gap after walking the first 1.7 miles of the Lakes Trail, in which case the distance involved is 6.3 miles, and the elevation gain 3,920 feet. This is steep, strenuous climb, but still quite possible as a dayhike, to reach one of the most accessible west-side high summits of the Sierra Nevada range. Bear Hill Trail 1.6 300 Along with the nearby Soldiers and Moro Rock trails, the Bear Hill Trail connects Giant Forest Village with Moro Rock and so together with one of the other two can be used to form a loop of around 4 miles. From the northern trailhead along the Generals Highway the path climbs quite steeply through the sequoia forest up to the eponymous hill then stays fairly level, following the 6,600 foot contour line and meeting the Crescent Rock Road near the Moro Rock turn-off. 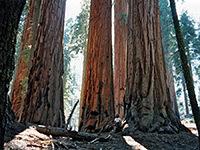 Big Trees Trail 1.2 (loop) 60 The Big Trees Trail starts next to Giant Forest Museum and winds around the edge of a large grassy clearing (Round Meadow), filled with countless wildflowers in spring and summer, and lined by several very large sequoia. The path is paved, wheelchair accessible and has trailside exhibits. Circle Meadow Trail 1.8 (loop) 60 Long, narrow Circle Meadow bends about 120° around a small hill at the center of the Giant Forest, lined with plenty of tall sequoia; the loop trail along its inner edge may be accessed from several other paths (Congress Trail, Alta Trail or Huckleberry Trail). Congress Trail 2 (loop) 160 Starting at the famous General Sherman tree (a third of a mile downhill from the nearest parking area), this easy, paved path loops past numerous other large sequoias, some bearing governmental names including the Senate and House groups, the President tree (240 feet tall), General Lee tree and McKinley tree. The path offers one of the best introductions to the scenery of the forest, but is apt to be quite busy, and some parts are close enough to the highway to experience some traffic noise. Crescent Meadow and Log Meadow 2.0 (loop) 190 The path to Crescent Meadow loops around the green, grassy clearing in the forest and continues to the nearby Log Meadow (at the north end of which is the historic Tharps Log); a good trail to see both large sequoia trees and wildflowers. The parking area is at the end of the 3 mile road that leaves the main park drive near Giant Forest Museum and also passes close to Moro Rock and Tunnel Log. Paths run along both sides of each meadow allowing several shorter loop hikes. Hazelwood Nature Trail 1.0 (loop) 50 Hazelwood is an easy path through tall trees alongside a small stream (Little Deer Creek) and is accompanied by various trailside information notices about the sequoia, and man's impact on them. The trailhead is located next to Giant Forest Lodge. High Sierra Trail This is one of the main trans-Sierra backpacking trails - it leads to remote Kern Canyon then intersects the John Muir Trail and climbs to the summit of Mt Whitney - but the initial section is good for a day hike. Parking area is at Crescent Meadow, 3 miles from Giant Forest Village. As well as the large trees, the first few miles of the hike reaches various viewpoints, meadows, and Panther Creek, which has cascades and a waterfall. Huckleberry Trail 4.0 (loop) 400 The first part of this route is along the Hazelwood Nature Trail, from which two continuation paths branch off and form a 4 mile loop, leading through meadows and sequoia woodland, to an old log cabin built around 1880 (Squatters Cabin - reached after 1.5 miles), and the Washington Tree which used to be the second largest in Sequoia National Park but partially collapsed in January 2005 following a fire. Junctions along the way lead to various other destinations including Crescent Meadow, Tharps Log and the Congress Group. Moro Rock Trail 1.8 300 The lightly used Moro Rock Trail links Giant Forest Village with Moro Rock, running through thick sequoia forest fairly close to the paved road to that same location. Most people just walk the final 1/4 mile of the trail, from the roadside parking area up to the viewpoint on top of the rock. Rimrock Trail 1.2 400 Starting a short distance along the Hazelwood Nature Trail, the Rimrock route heads north though lush sequoia forest with plenty of large trees, staying quite close to the Generals Highway but soon rising quite far above. It ends at a junction with the Alta Trail near the Congress Group. Soldiers Trail 1.4 250 This trail is one of three that cross the undulating terrain between Giant Forest Village and Moro Rock; most of the route is through a dense sequoia forest, filled with moss and ferns as well as the big trees. Near the south end the path runs alongside a small elongated meadow, crosses the Crescent Meadow Road then meets the Moro Rock Trail shortly before the final climb to the overlook. Sugar Pine Trail 1.4 200 The Sugar Pine Trail links Moro Rock and Crescent Meadow, running through the forest a little way south of the paved Crescent Meadow Road. The western half of the hike encounters quite thick woodland, either side of a ravine formed by a tributary of Crescent Creek; the eastern portion crosses more open terrain, and offers some views to the valleys below. Sunset Rock Trail 0.8 150 Like Moro Rock, Sunset Rock is a smooth granite dome, rising above the surrounding forest, and considered to be a good place to watch the setting sun. The short trail to the rock starts from the main parking area at Giant Forest Village. Trail of the Sequoias 2.2 400 Although the named footpath is just over 2 miles long, a one-way trip on the Trail of the Sequoias involves a minimum hike of 4 miles, including parts of the Congress and Crescent Meadow Trails used to reach the start and end points. Most of the route is through remote, peaceful but unspectacular sequoia forest either side of upper Crescent Creek. Wolverton Cutoff Trail 5.0 600 Scenery along the Wolverton Cutoff Trail is a typical mixture of small streams, wooded hills, sequoia groves and meadows; the trail is the easternmost in the Giant Forest area and links the Wolverton Road with the High Sierra Trail. The path is used mostly by backpackers (and horse traffic) heading to the high Sierra, rather than day hikers. Little Baldy Trail 1.7 700 Starting 6 miles west of Lodgepole along highway 198, a lesser used path makes the easy climb to one of the many rounded granite summits of Sequoia National Park: 8,044 foot Little Baldy, which overlooks the park road as well as many square miles of the surrounding forest. Tokopah Falls Trail 1.7 560 A pleasant trail alongside the Marble Fork of the Kaweah River, this leads to the 1,200 foot Tokopah Falls - not a single drop, rather a sequence of cascades down a granite hillside, but still very dramatic. The trailhead is at the Lodgepole Campground, 4.5 miles north of Giant Forest Village. Like all Sierra Nevada waterfalls, this is most impressive in spring, during the snowmelt season. Twin Lakes Trail 7.0 2,600 From the Lodgepole campground, this path climbs quite steeply up above Stillman Creek, over a ridge to Clover Creek and on to twin glacial lakes at 9,419 feet. After here is a steeper ascent to Stillman pass, at the top of the Kaweah Divide, and a continuation trail on the far side, linking with other backcountry routes in Sugarloaf Valley. Lakes Trail From Wolverton Creek, at the end of the spur rood south of Lodgepole Visitor Center, this trail climbs steadily up the mountain slopes and passes close to four beautiful glacial lakes - Heather, Aster, Emerald and Pear. The trail ends just north of 11,204 foot Alta Peak, though still nearly 2,000 feet below; the summit can however be reached via the Alta Trail, which runs close to the Lakes Trail and may be joined via the short Panther Gap cut-off trail after 1.7 miles. Long Meadow Trail 2.4 200 This pleasant trail loops right around the edge of Long Meadow, which has trees growing along the perimeter but sparsely wooded, rockier slopes above. A small section of the loop is along the Wolverton Road, which is used to reach the trailhead. Marble Falls Trail 3.5 1,900 The moderately steep Marble Falls Trail begins at Potwisha campground, 4 miles after the Sequoia National Park entrance station on CA 198, and follows Marble Canyon upstream to its falls, actually a sequence of cascades in quite a narrow canyon. Middle Fork Trail 7.0 1,000 From Buckeye Flat Campground, reached by a side road 6.5 miles into the park along CA 198, a long trail heads east along the deep canyon of the Middle Fork of the Kaweah River - always on the north side, and a hundred or more feet above the water because of the steepness of the cliffs that enclose the river. The path crosses several tributary streams and climbs steadily up the side of the canyon, through grassy, bushy land, entering pine forest after a walk of 15 miles or so. The suggested target for a day hike is Panther Creek after 7 miles. Atwell-Hockett Trail 10.0 1,950 Starting point for this hike is Atwell Mill, about 4/5 along the Mineral King road. Unlike others in the vicinity, this doesn't climb particularly high, instead crossing foothills around the East Fork of the Kaweah River, Deer Creek, Clover Creek and later Whitman Creek, ending at Hockett Meadows, which has a ranger station. Other trails lead further south from the meadows, eventually leaving the national park. Eagle Lake 3.4 2,150 Starting at the far end of the Mineral King road, this trail climbs diagonally up the side of Kaweah River valley, then alongside Eagle Creek to Eagle Lake, in a sheltered alcove at 10,010 feet. Another branch of the trail leads to Mosquito Lakes, a group of four smaller glacial lakes on the far side of Miners Ridge. Farewell Gap, Franklin Pass 5.0, 6.5 2,780, 3,900 From the Eagle/Mosquito trailhead at the end of the road to Mineral King, this trail starts off mostly level, following beside the Kaweah River for 2 miles. 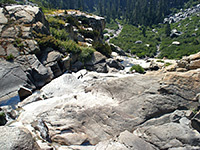 Then it starts to climb steeply, soon after the river is joined by Franklin Creek from the north, and after ascending about 1,500 feet, the trail splits; the branch straight on, continuing south, leads to a pass at 10,586 feet (Farewell Gap), on the national park boundary, then beyond the path descends towards the Little Kern River valley in the Sequoia National Forest. 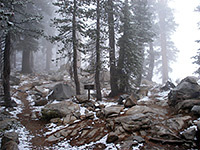 The main trail is to the left (east) - round to the far side of Tulare Peak, past the twin Franklin Lakes to 11,800 foot Franklin Pass. This is a good target for a day hike though as usual with hikes in this area, the path continues much further, towards Kern Valley. Monarch Lakes, Crystal Lake 4.2, 4.9 3,150, 3,550 This trail switchbacks up the west side of Mineral Peak, through woodland and meadows, and reaches a junction at 10,028 feet. The south fork passes the long abandoned Chihuahua Mine and ends at Crystal Lake, situated in a bowl-shaped valley. The main trail soon passes the two Monarch Lakes and continues beyond by climbing more steeply to 11,670 foot Sawtooth Pass from where a long route continues east towards Kern Canyon. Tar Gap Trail 12.0 1,100 Like the Atwell-Hockett Trail, this crosses more gentle terrain, linking Cold Springs campground with Hockett Meadows, across mountain slopes with many crossings of streams and meadows. Timber Gap Trail 6.0 1,600 The Timber Gap Trail is one of several that begins from the Sawtooth trailhead, at the far end of the road to Mineral King. It climbs over a thousand feet up the mostly treeless slopes of Empire Mountain to a low pass at 9,511 feet, then follows Timber Gap Creek down to its junction with Cliff Creek, which at 6 miles, is a good target for a day hike, though other trails continue both directions along this creek, leading upstream to the Little Five Lakes region and the High Sierra Trail, and downstream to Redwood Meadow and the Middle Fork of the Kaweah River.